Sudden cardiac death (SCD) and arrhythmia represent a major worldwide public health problem, accounting for 15–20 % of all deaths. Early resuscitation and defibrillation remains the key to survival, yet its implementation and the access to public defibrillators remains poor, resulting in overall poor survival to patients discharged from hospital. Novel approaches employing smart technology may provide the solution to this dilemma. Though the majority of cases are attributable to coronary artery disease, a thorough search for an underlying cause in cases where the diagnosis is unclear is necessary. This enables better management of arrhythmia recurrence and screening of family members. The majority of cases of SCD occur in patients who do not have traditional risk factors for arrhythmia. New and improved large scale screening tools are required to better predict risk in the wider population who represent the majority of cases of SCD. Arrhythmia & Electrophysiology Review 2018;7(2):111–7. 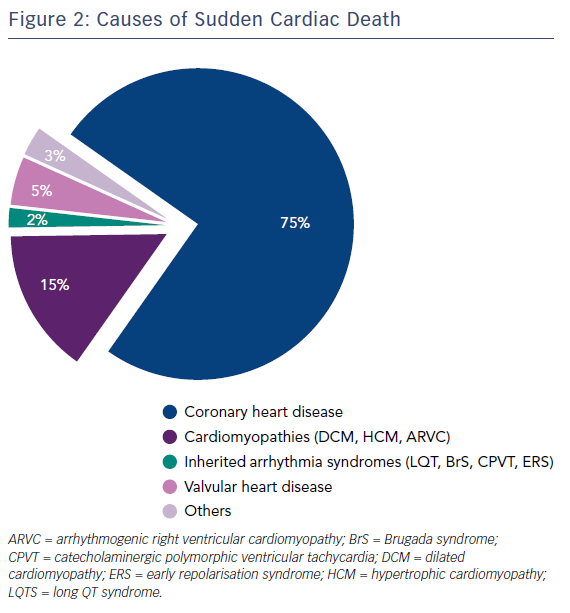 An estimated 180,000–300,000 sudden cardiac deaths (SCD) occur in the US annually.1,2 Worldwide, sudden and unexpected cardiac death is the most common cause of death,2 accounting for 17 million deaths every year with SCD accounting for 25 % of these. The accepted definition of SCD is death that occurs within one hour of onset of symptoms in witnessed cases, and within 24 hours of last being seen alive when it is unwitnessed.2 The majority of deaths are unwitnessed, with VF being the final underlying mechanism.2–5 The majority of patients are found in asystole or pulseless electrical activity (PEA) and heart block is increasingly noted as an aetiology. Despite the decline in cardiovascular deaths over the past several decades,6 due to improved preventative strategies, the incidence of SCD as a proportion of overall cardiovascular deaths has increased.2 This has occurred because in-hospital mortality has declined more rapidly,2 highlighting the need for better risk stratification methods and preventative strategies. Medical therapy with class Ic agents or amiodarone to prevent SCD has been shown to be to be ineffective.7,8 The major advance in the prevention of SCD has been the development of the ICD.9 Secondary prevention trials, Antiarrhythmic Versus Implantable Defibrillator (AVID),10 Canadian Implantable Defibrillator Study (CIDS)11 and Cardiac Arrest Study of Hamburg (CASH),12 have demonstrated statistically significant improvement in survival rates with ICD implantation compared with drug therapy in this patient population. 5. integrated post-cardiac arrest care. Assessment of patients who survive an out-of-hospital cardiac arrest involves a thorough history of the nature of events, including collateral history. The causes of SCD are shown in Figure 2, with ischaemic heart disease being the most common cause. Symptoms prior to the event, such as chest pain, palpitations and breathlessness syncope or pre-syncope, should be assessed. Risk factors, such as hypertension, diabetes, hyperlipidaemia and smoking, should be sought. A drug history should be attained, along with specific questions relating to recreational drug use and use of psychiatric drugs that may prolong the QT interval. Additionally precipitating factors, such as exercise and emotional stress, should be looked for, as well as family history. The 12-lead ECG remains the hallmark of initial non-invasive evaluation. Where there is evidence of ischaemia, prompt coronary intervention should be performed. However, even in the absence of ischaemic changes on the ECG, up to 29 % of patients with out-of-hospital cardiac arrest will have a culprit lesion, and PCI in this setting is associated with a two-fold outcome in cerebral performance category.30 Thus, all patients should have ischaemia assessed both through the 12-lead ECG and through invasive coronary angiography. The ECG should also be closely analysed for evidence of inherited cardiac conditions and structural cardiac abnormalities. Common inherited cardiac conditions to look for on an ECG include Brugada syndrome, long and short QT and early repolarisation. Additionally, structural cardiac abnormalities, such as HCM, ARVC and dilated cardiomyopathy (DCM), may also present with characteristic ECG changes. Where cases of ischaemic heart disease are excluded, EF is preserved and repolarisation disorders are not apparent on the resting ECG, further assessment is required. This may increase the diagnostic yield and provide a diagnosis in nearly half of patients where an initial diagnosis is unclear.32 Figure 3 describes the Barts Protocol for Assessment of such patients, and Table 1 details the diagnostic criteria. Initial assessment involves a lying and standing ECG to look for evidence of QT prolongation during brief tachycardia induced by standing, which may expose concealed LQT1 and LQT2 phenotypes.33,34 This is followed by exercise testing to look for QT prolongation on exercise or a failure to shorten the QT interval on exercise, which is a prominent feature of the exercise ECG in LQT1 patients.34 Figure 4 shows an example of QT prolongation on exercise along with the tangent method for measuring the QT interval. During treadmill testing particular attention should also be paid to the recovery ECG during the first 1–4 minutes, as LQT2 patients may only exhibit QT prolongation in the recovery phase of exercise where sympathetic withdrawal may provoke late QT lengthening.34,35 A QTc >445 ms at 4 minutes of recovery has been shown to have a sensitivity of 92 % and specificity of 88 % in identifying LQT1 and LQT2 individuals.35 Exercise testing may also expose polymorphic or bidirectional VT, which may hint at a diagnosis of catecholaminergic polymorphic ventricular tachycardia (CPVT) as demonstrated in Figure 5A, though this test is neither sensitive nor specific for the condition. Additionally, we routinely record the ECG in the standard and high-right precordial positions36 to look for characteristic evidence of type 1 Brugada ECG change.37 We also perform provocative testing using ajmaline at a dose of 1 mg/kg over 5 minutes, with the ECG right precordial leads in the high and standard positions, though the sensitivity and specificity of this is debated.36 Figure 6 shows an example of a positive ajmaline challenge test. Echocardiography and cMRI form the mainstay of assessment to look for evidence of structural cardiac causes. cMRI is increasingly proving to be useful through the ability to detect morphological abnormalities and characterise tissue fibrosis, which provides vital clues to the pathogenesis of sudden cardiac arrest.31 Increasingly, where patients do not have a history or ECG changes that warrant immediate coronary intervention, cardiac CT is being used to look at the coronary anatomy and anomalous coronary artery courses, thus negating the need to conventional angiography. Electrophysiological testing has not been shown to influence management or predict outcome in cardiac arrest survivors,38 and its role in management and risk prediction in inherited conditions, such as Brugada syndrome, is debated.39 We only perform this in cases where pre-excitation is suspected. Genetic testing is useful where a clear diagnosis is established or the pre-test probability is high, such that a positive test will influence the management not only of the patient but of their family. Cardiac biopsy may have a role in diagnosing inflammatory or infiltrative diseases, such as myocarditis or sarcoidosis, but is increasingly less used with the advent of advanced imaging modalities, such as cMRI and PET-CT, which we only perform when the imaging findings are in doubt in cases of suspected sarcoidosis. While implantation of an ICD remains the mainstay of management in most patients who survive an out-of-hospital cardiac arrest, in patients who cannot have an ICD due to clinical reasons or where patients are undecided about having an ICD, the ZOLL® LifeVest may be considered as a bridge to ICD implantation or until the arrhythmic risk subsides.40 In patients who have an ICD implanted, further appropriate ICD therapy is seen in >23 % of cases.32 Identifying the cause of the cardiac arrest is important as this may allow directed therapy that reduces the risk of future cardiac arrest, and may also allow for the identification and prevention of the same, potentially inherited, condition in first-degree relatives. Avoidance of fever, including the use of anti-pyretics and avoidance of drugs that precipitate arrhythmia and type 1 ECG change, is the mainstay of treatment in Brugada syndrome (brugadadrugs.org).47 Acute VT storms respond well to isoproterenol infusion and hydroquinidine can be used as an oral alternative in patients with recurrent ICD therapy.20 Increasingly, epicardial substrate ablation is showing promise48 and may become a major component in patient management. Early repolarisation syndrome responds in a similar manner to Brugada syndrome, with isoproterenol infusion and hydroquinidine being useful treatments. In some patients with early repolarisation syndrome, VT/VF is triggered by closely coupled ectopic beats (Figure 5B and C), and suppression of these using either beta-blockade, calcium channel blockers or ablation may be useful. Management of cardiomyopathies is best performed in specialist clinics, where the multitude of symptoms, as well as family screening and follow up, can be performed by physicians with an expertise in the field. Beta-blockers and amiodarone remain the mainstay of treatment for recurrent ventricular arrhythmia in HCM and DCM. Sotolol is the initial drug of choice during the active arrhythmia phase of ARVC, followed by amiodarone or beta-blockers. Catheter ablation may prove useful in reducing arrhythmia burden in ARVC53 and DCM. Family screening in cases where the diagnosis is clear, or where a clear pathogenic genetic mutation is identified, is necessary to exclude a diagnosis in first-degree relatives, and to manage their risk accordingly. Additionally, screening the family members of victims from unexplained sudden death may identify a disease phenotype that is latent in the proband,54 and may aid in diagnosing and managing the risk to relatives.55 Our screening of family members follows the Barts Protocol. SCD and arrhythmia continues to represent a major international public health problem and is still the biggest killer worldwide, despite huge improvements in cardiovascular care in the past 30 years. The majority of patients do not survive to hospital discharge, highlighting the need for larger and better public health initiatives to improve the chain of survival. Importantly, the majority of events occur in patients without traditional risk factors for cardiac events, highlighting the need for new and better markers of arrhythmic risk. In patients who survive to arrival at hospital, a thorough assessment of the underlying aetiology is required, and where the diagnosis is unclear, further testing including provocation testing and cMRI is warranted. Management of further arrhythmic events is dependent on the underlying aetiology and screening of family members may aid not only in establishing a diagnosis but also in managing arrhythmic risk of first-degree relatives. Chugh SS, Reinier K, Teodorescu C, et al. 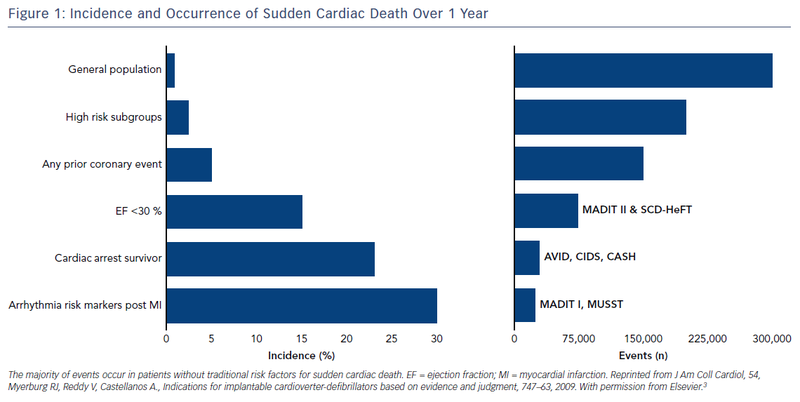 Epidemiology of sudden cardiac death: clinical and research implications. Prog Cardiovasc Dis 2008;51:213–28. Adabag AS, Luepker RV, Roger VL, Gersh BJ. Sudden cardiac death: epidemiology and risk factors. Nat Rev Cardiol 2010;7:216–25. Myerburg RJ, Reddy V, Castellanos A. Indications for implantable cardioverter-defibrillators based on evidence and judgment. J Am Coll Cardiol 2009;54:747–63. Rea TD, Page RL. Community approaches to improve resuscitation after out-of-hospital sudden cardiac arrest. Circulation 2010;121:1134–40. Estes NA. Predicting and preventing sudden cardiac death. Circulation 2011;124:651–6. Niemeijer MN, van den Berg ME, Leening MJG, et al. Declining incidence of sudden cardiac death from 1990–2010 in a general middle-aged and elderly population: the Rotterdam study. Heart Rhythm 2015;12:123–9. Bardy GH, Lee KL, Mark DB, et al. Amiodarone or an implantable cardioverter-defibrillator for congestive heart failure. N Engl J Med 2005;352:225–37. Echt DS, Liebson PR, Mitchell LB, et al. Mortality and morbidity in patients receiving encainide, flecainide, or placebo. The Cardiac Arrhythmia Suppression Trial. N Engl J Med 1991;324:781–8. Nanthakumar K, Epstein AE, Kay GN, et al. Prophylactic implantable cardioverter-defibrillator therapy in patients with left ventricular systolic dysfunction: a pooled analysis of 10 primary prevention trials. J Am Coll Cardiol 2004;44:2166–72. Antiarrhythmics versus Implantable Defibrillators (AVID) Investigators. A comparison of antiarrhythmic-drug therapy with implantable defibrillators in patients resuscitated from near-fatal ventricular arrhythmias. N Engl J Med 1997;337:1576–83. Connolly SJ, Gent M, Roberts RS, et al. Canadian implantable defibrillator study (CIDS): a randomized trial of the implantable cardioverter defibrillator against amiodarone. Circulation 2000;101:1297–302. Kuck KH, Cappato R, Siebels J, Rüppel R. Randomized comparison of antiarrhythmic drug therapy with implantable defibrillators in patients resuscitated from cardiac arrest: the cardiac arrest study Hamburg (CASH). Circulation 2000;102:748–54. Moss AJ, Hall WJ, Cannom DS, et al. Improved survival with an implanted defibrillator in patients with coronary disease at high risk for ventricular arrhythmia. Multicenter Automatic Defibrillator Implantation Trial Investigators. N Engl J Med 1996;335:1933–40. Buxton AE, Lee KL, Fisher JD, et al. A randomized study of the prevention of sudden death in patients with coronary artery disease. N Engl J Med 1999;341:1882–90. Moss AJ, Zareba W, Hall WJ, et al. Prophylactic implantation of a defibrillator in patients with myocardial infarction and reduced ejection fraction. N Engl J Med 2002;346:877–83. Kadish A, Dyer A, Daubert JP, et al. Prophylactic defibrillator implantation in patients with nonischemic dilated cardiomyopathy. N Engl J Med 2004;350:2151–8. Moss AJ, Fadl Y, Zareba W, et al. Survival benefit with an implanted defibrillator in relation to mortality risk in chronic coronary heart disease. Am J Cardiol 2001;88:516–20. Priori SG, Wilde AA, Horie M, et al. HRS/EHRA/APHRS expert consensus statement on the diagnosis and management of patients with inherited primary arrhythmia syndromes: document endorsed by HRS, EHRA, and APHRS in May 2013 and by ACCF, AHA, PACES, and AEPC in June 2013. Heart Rhythm 2013;10:1932–63. Lyon RM, Cobbe SM, Bradley JM, Grubb NR. Surviving out of hospital cardiac arrest at home: a postcode lottery? Emerg Med Jl 2004;21:619–24. Hasselqvist-Ax I, Riva G, Herlitz J, et al. Early cardiopulmonary resuscitation in out-of-hospital cardiac arrest. N Engl J Med 2015;372:2307–15. Lund-Kordahl I, Olasveengen TM, Lorem T, et al. Improving outcome after out-of-hospital cardiac arrest by strengthening weak links of the local chain of survival; quality of advanced life support and post-resuscitation care. Resuscitation 2010;81:422–6. Yannopoulos D, Bartos JA, Raveendran G, et al. Coronary artery disease in patients with out-of-hospital refractory ventricular fibrillation cardiac arrest. J Am Coll Cardiol 2017;70:1109–17. Boyce LW, Vliet Vlieland TP, Bosch J, et al. High survival rate of 43% in out-of-hospital cardiac arrest patients in an optimised chain of survival. Neth Heart J 2014;23:20–5. Pollack RA, Brown SP, Rea T, et al. Impact of bystander automated external defibrillator use on survival and functional outcomes in shockable observed public cardiac arrests. Circulation 2018;epub ahead of press. Murakami Y, Iwami T, Kitamura T, et al. Outcomes of out-of-hospital cardiac arrest by public location in the public-access defibrillation era. J Am Heart Assoc 2014;3:e000533. Deakin CD, Shewry E, Gray HH. Public access defibrillation remains out of reach for most victims of out-of-hospital sudden cardiac arrest. Heart 2014;100:619–23. Boutilier JJ, Brooks SC, Janmohamed A, et al. Optimizing a drone network to deliver automated external defibrillators. Circulation 2017;135:2454–65. Dumas F, Bougouin W, Geri G, et al. Emergency percutaneous coronary intervention in post–cardiac arrest patients without ST-segment elevation pattern. JACC Cardiovasc Interv 2016;9:1011–8. Rodrigues P, Joshi A, Williams H, et al. Diagnosis and prognosis in sudden cardiac arrest survivors without coronary artery disease: utility of a clinical approach using cardiac magnetic resonance imaging. Circ Cardiovasc Imaging 2017;10:e006709. Herman AR, Cheung C, Gerull B, et al. Outcome of apparently unexplained cardiac arrest: results from investigation and follow-up of the prospective cardiac arrest survivors with preserved cardiac arrest survivors with preserved ejection fraction registry. Circ Arrhythm Electrophysiol 2016;9:e003619. Viskin S, Postema PG, Bhuiyan ZA, et al. The response of the QT interval to the brief tachycardia provoked by standing: a bedside test for diagnosing long QT syndrome. J Am Coll Cardiol 2010;55:1955–61. Wong JA, Gula LJ, Klein GJ, et al. Utility of treadmill testing in identification and genotype prediction in long-QT syndrome. Circ Arrhythm Electrophysiol 2010;3:120–5. Chattha IS, Sy RW, Yee R, et al. Utility of the recovery electrocardiogram after exercise: a novel indicator for the diagnosis and genotyping of long QT syndrome? Heart Rhythm 2010;7:906–11. Obeyesekere MN, Klein GJ, Modi S, et al. 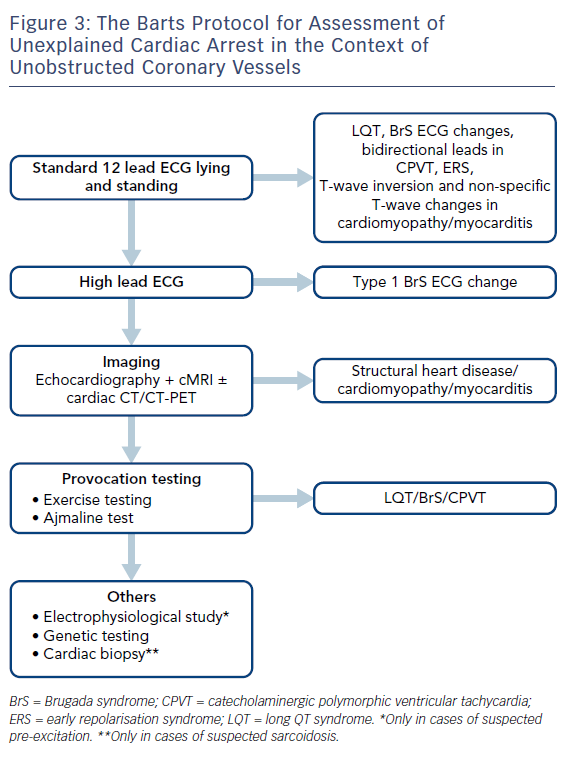 How to perform and interpret provocative testing for the diagnosis of Brugada syndrome, long-QT syndrome, and catecholaminergic polymorphic ventricular tachycardia. Circ Arrhythm Electrophysiol 2011;4:958–64. Brugada R, Campuzano O, Sarquella-Brugada P, et al. Brugada Syndrome. Methodist Debakey Cardiovasc 2014;10:25–8. Poole JE, Mathisen TL, Kudenchuk PJ, et al. Long-term outcome in patients who survive out of hospital ventricular fibrillation and undergo electrophysiologic studies: evaluation by electrophysiologic subgroups. J Am Coll Cardiol 1990;16:657–65. Krahn AD, Healey JS, Chauhan V, et al. Systematic assessment of patients with unexplained cardiac arrest: cardiac arrest survivors with preserved ejection fraction registry (CASPER). Circulation 2009;120:278–85. Wäßnig N, Günther M, Quick S, et al. Experience with the wearable cardioverter-defibrillator in patients at high risk for sudden cardiac death. Circulation 2016;134:635–43. Tung R, Boyle NG, Shivkumar K. Catheter ablation of ventricular tachycardia. Circulation 2011;123:2284–8. Chockalingam P, Crotti L, Girardengo G, et al. Not all beta-blockers are equal in the management of long QT syndrome types 1 and 2: higher recurrence of events under metoprolol. J Am Coll Cardiol 2012;60:2092–9. Steinberg C, Padfield GJ, Al-Sabeq B, et al. Experience with bisoprolol in long-QT1 and long-QT2 syndrome. J Interv Card Electrophysiol 2016;47:163–70. Schwartz PJ, Priori SG, Locati EH, et al. Long QT syndrome patients with mutations of the SCN5A and HERG genes have differential responses to Na+ channel blockade and to increases in heart rate: implications for gene-specific therapy. Circulation 1995;92:3381–6. Odero A, Bozzani A, De Ferrari GM, Schwartz PJ. Left cardiac sympathetic denervation for the prevention of life-threatening arrhythmias: the surgical supraclavicular approach to cervicothoracic sympathectomy. Heart Rhythm 2010;7:1161–5. Woosley RL, Heise CW, Romero, KA. QTdrugs List. Available at: crediblemeds.org (Accessed 11 May 2018). Postema PG, Wolpert C, Amin AS, et al. Drugs and Brugada syndrome patients: review of the literature, recommendations and an up-to-date website (www.brugadadrugs.org). Heart Rhythm 2009;6:1335–41. Nademanee K, Veerakul G, Chandanamattha P, et al. Prevention of ventricular fibrillation episodes in Brugada syndrome by catheter ablation over the anterior right ventricular outflow tract epicardium. Circulation 2011;123:1270–9. Kaneshiro T, Naruse Y, Nogami A, et al. 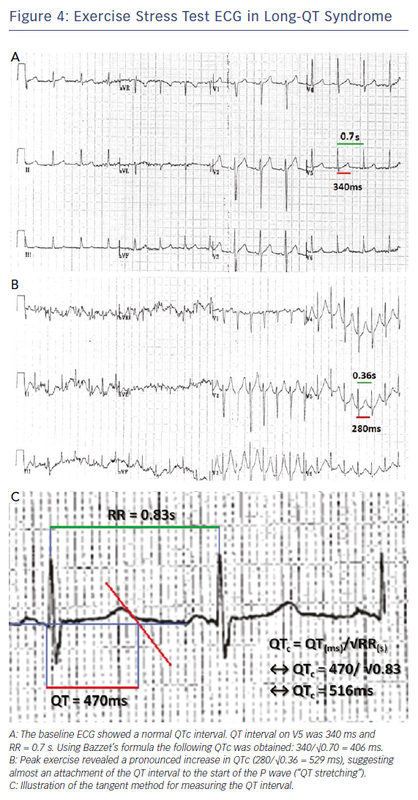 Successful catheter ablation of bidirectional ventricular premature contractions triggering ventricular fibrillation in catecholaminergic polymorphic ventricular tachycardia with RyR2 mutation. Circ Arrhythm Electrophysiol 2012;5:e14–7. Visser M, van der Heijden JF, van der Smagt JJ, et al. Long-term outcome of patients initially diagnosed with idiopathic ventricular fibrillation: a descriptive study. Circ Arrhythm Electrophysiol 2016;9:e004258. Belhassen B, Glick A, Viskin S. Efficacy of quinidine in high-risk patients with Brugada syndrome. Circulation 2004;110:1731–7. Knecht S, Sacher F, Wright M, et al. Long-term follow-up of idiopathic ventricular fibrillation ablation: a multicenter study. J Am Coll Cardiol 2009;54:522–8. Philips B, Madhavan S, James C, et al. Outcomes of catheter ablation of ventricular tachycardia in arrhythmogenic right ventricular dysplasia/cardiomyopathy. Circ Arrhythm Electrophysiol 2012;5:499–505. Honarbakhsh S, Srinivasan N, Kirkby C, et al. Medium-term outcomes of idiopathic ventricular fibrillation survivors and family screening: a multicentre experience. Europace 2017;19:1874–80. Quenin P, Kyndt F, Mabo P, et al. Clinical yield of familial screening after sudden death in young subjects: the French experience. Circ Arrhythm Electrophysiol 2017;10:e005236.